With increasing demand for heavy lifts in space restricted or remote locations, Enerpac Heavy Lifting Technology is holding a series of demonstration days for heavy transport, industrial moving and heavy lift companies showing the advantages and cost savings of using hydraulic gantries, jack-ups and skidding systems. On May 14 – 18 at its Hengelo facility in The Netherlands, Enerpac is demonstrating the new JS-125 JS-Series Jack-up system and Low Height Skidding Systems together with a range of hydraulic gantries from 60 tonne to up to 1000 tonne capacity, strand jacks, Synchoist, EVO-Series Synchronous Lifting Systems and Self-Propelled Modular Transporter (SPMT). Enerpac’s lifting systems increase the lifting options for heavy lift projects. They are ideal for industrial moves involving lifting, transporting and installing machines and plant, together with in-plant machinery moves. For larger lifting projects typically found in the civil infrastructure, power generation, rail, ship building and oil and gas industries, for example, Enerpac system provide the stability and synchronised lifting capability needed to ensure an accurate and safe lift. 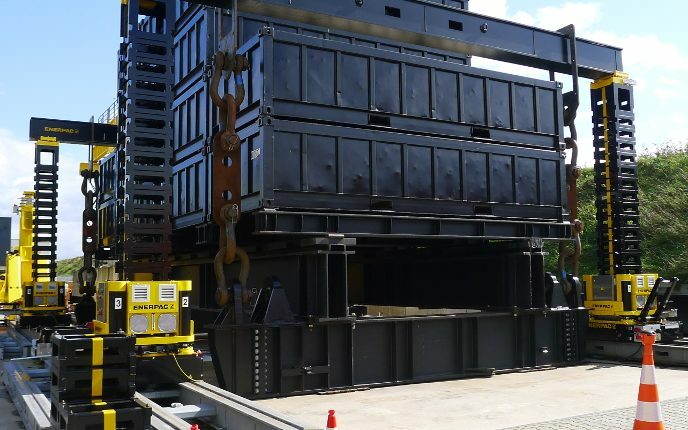 In addition to demonstrations of Enerpac lifting systems, the Demonstration Days will include a tour of the Hengelo manufacturing and testing facilities. The site has undergone major investment over the past 12 months, leading to a significant reduction in delivery times and enabling manufacture for stock. As well as the opportunity to network with peers and customers, Enerpac project engineers will be on hand to and to discuss specific project challenges and how Enerpac is able to assist in solving them.